This week’s topic is “Top Ten Favorite 2016 Releases So Far This Year.” As I’m writing this post, I’ve read a total of 51 new releases for 2016. That’s a LOT of new books. Of those, I’ve given 26 five star reviews. I know what you’re thinking, I give a lot of 4 and 5 star reviews, and that’s true. I do give a lot, mainly because my ratings are based on how I felt about the book versus an actual critique of the work. Not that I don’t also critique the work, I do. It’s just I read a lot of indie work and well sometimes those authors can’t afford the best editors. I’m willing to forgive poor editing when there is a fantastic story told. Anyways, that’s my soapbox and for another time 😉 Here are my top ten new releases for 2016 so far, in no particular order. Titles link to Amazon (affiliate). Ruined by Amy Tintera: I adored this first book in the Ruined series. It combined my favorite elements from Throne of Glass and Red Queen while remaining unique. Emelina was a hard character to like, yet her circumstances drew me in to her story. I rooted for her, cried with her, and fell in love. Definitely a book for fans of fantasy and revenge stories. To see my review of Ruined, click here. Strain of Resistance by Michelle Bryan: I’m a bit biased when it comes to this author. She was one of the first people I ever met through blogging and is one of my biggest cheerleaders Yet she surprised me with her newest book, the first in a new adult dystopian series. I was SHOCKED by the foul-mouthed Bixby, but despite her crassness I fell for her. She’s a strong character who hides her hurt under her attitude. AND the dystopian world *shiver* don’t get me started. It’s not one I’d want to live in, yet I couldn’t tear my eyes away from the pages. To see my review of Strain of Resistance, click here. Pimpernel by Sheralyn Pratt: Y’all know I usually steer clear of contemporary. It’s just not my thing. But every now and then I come across one that I love and Pratt’s newest novel is a new favorite of mine. A loose expansion of the classic The Scarlet Pimpernel, Pratt tells the story of a young woman with severe OCD who is off her medication and caught up in the scam of a lifetime. The Pimpernel comes to the rescue, planning to bust her, but instead finds he wants to protect her as much as his clients, if not more. This one is for fans of contemporary romance and crime/mystery. To see my review of Pimpernel, click here. The Queen of All that Lives by Laura Thalassa: This is another favorite author of mine and one I’m a little biased on. I’ve yet to read one of Thalassa’s books and NOT like it. I love them all and each is unique and full of swoon-worthy moments. The Fallen World trilogy is her dystopian new adult series and this last book was fantastic! Montes and Serenity are two of my favorite characters ever and their relationship is full of ups and downs. I could not set this book down as I had to know what would happen and then I didn’t want it to be over! To see my review of The Queen of All that Lives, click here. Paper Dolls by Hanna Peach: Another of my favorite indie authors 😀 This particular book is WAY different than my normal read, but I devoured it! I can tell you nothing about the book as I do not want to spoil it. Because trust me if I tell you anything I risk revealing the plot twist and we don’t want that 😉 If you enjoy romantic suspense, than I highly suggest you grab this one. It is AMAZING!!! To see my review of Paper Dolls, click here. Strings by David Estes: This is a retelling of the classic Pinocchio and a bit of a gender reversal as well. The main character Pia is a girl who has lived with strings that keep her alive her whole life. She’s never left the confines of the building her father works in. It’s kind of dystopia meets sci-fi and Estes does it brilliantly! To see my review of Strings, click here. The Shadow Queen by C.J. Redwine: Here is another retelling, this one of Snow White and the Seven Dwarves. I am in love with this book!!! I sincerely hope there will be more from the world of Ravenspire, but if there isn’t it is still a fantastic standalone. Lorelai is one of those characters that you just aren’t sure how to feel about, but as the story goes she grows on you. I felt for her, loved her struggles and how she choose to overcome them and LOVED the hints of romance. This is a story about good vs evil and keeps you guessing who will win in the end. To see my review of The Shadow Queen, click here. The Crown’s Game by Evelyn Skye: This is one of my more recent favorites. I loved everything about this book. I started it with high expectations and it exceeded them 😀 It’s set in an alternative historical Russia where magic exists. It pits two characters against each other in a magical duel to the death and I found myself torn on who to cheer for. There was even a bit of Cinderella thrown in as well. I loved, loved this story!! To see my review of The Crown’s Game, click here. The Crown by Kiera Cass: This IMHO is a fantastic conclusion to The Selection series. Eadlyn won me over after being indifferent to her during The Heir. And my ship sailed away into the land of happily ever afters. I could not have asked for a better ending 😀 To see my review of The Crown, click here. Sword and Verse by Kathy MacMillan: I was lucky enough to read this book early and actually read it in December of 2015, but it didn’t release until this year so I’m including it in my list. This is high fantasy at its best. I loved every aspect of this book from the characters who didn’t know who they could trust to the world and its mythology to the plot and its magnificent rebellion. If I had to chose a number one book for 2016, this would be it! To see my review of Sword and Verse, click here. I haven’t read any of these but I do have The Crown’s Game on hold at the library. Hopefully I can get it soon! 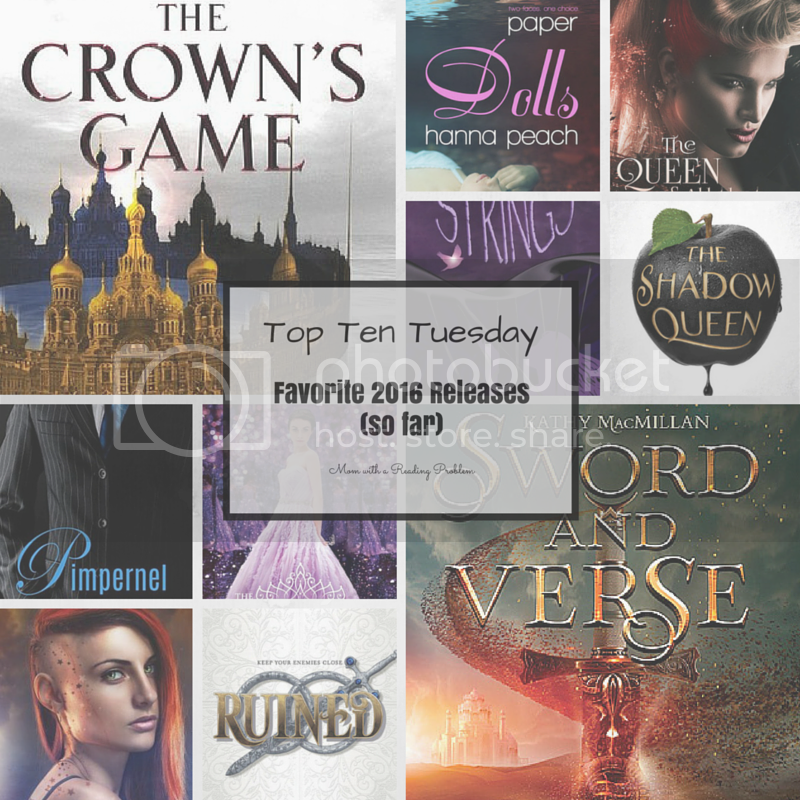 The only book I’ve read on your list is The Shadow Queen and I really enjoyed it! I’m hoping to read Sword and Verse, The Crown’s Game, and Ruined soon. I’ve heard really good things about them! Oh nice! I still need to read The Crown’s Game and The Shadow Queen! Great picks! Jessica @ a GREAT read recently posted…INKSLINGER BLOGGER PRESENTS: Torn Cover Reveal!! I mostly read Indie books so I can be more tolerant of editing issues unless they are REALLY bad! I agree that if it is a brilliant story, other things can be forgiven. I haven’t read any of these but a few of them are on my TBR.